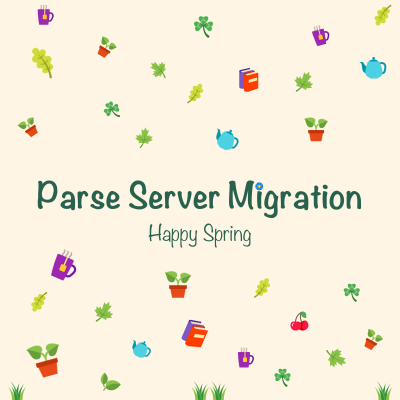 Since Parse has started closing down there have been a couple of databases that have tried to replace Parse for Mobile Apps such as Firebase and Realm. Firebase is the one that is currently becoming the most popular because of the ease of use and speed. 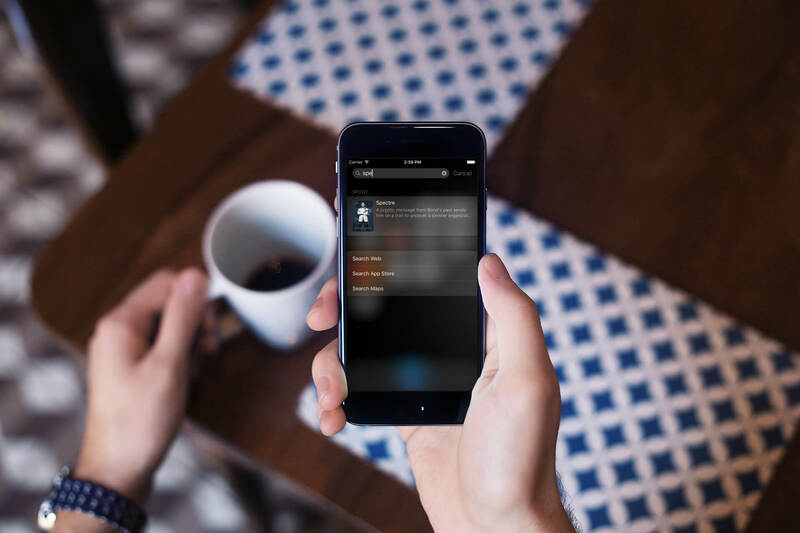 It also works with Android and Web as well as iOS which means that it is very useful for big projects because the database can be connected across all major devices. 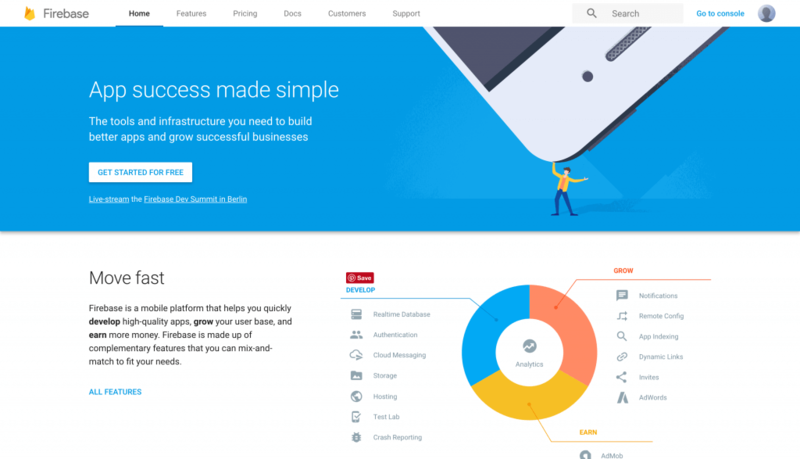 Firebase is owned by Google which means that the servers are very reliable and have great help on hand if needed. Firebase is also used by some very big tech companies like PicCollage, Shazam, Wattpad, Skyscanner and other big start-ups so you can see how reliable Firebase is. With the recent updates to Firebase it has become stronger and more powerful than ever. You can make money on the platform by using AdMob or keep user retention by using notifications or use cloud messaging and storage to make a very powerful app. Firebase is definitely here to stay. In this tutorial we are going to look at a key aspect of this which is Login and Sign Up. We will also be looking at resetting the user’s password. We will be using the latest version of Firebase and XCode and also Swift 3. 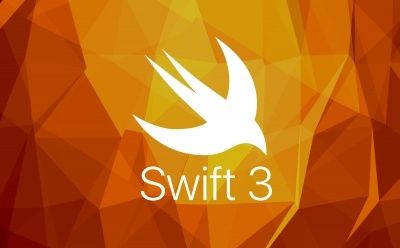 For this tutorial you need a basic to good understanding of Swift and XCode. The first thing we need to do is to start a new XCode Project, I am going to use a Single View Application but this concept will work on any style from Tab-Bar application to Master-Detail application. You can call this project whatever you want but for this tutorial I am going to call it FirebaseTutorial1. Set the Language to Swift and the device doesn’t matter so you can keep that universal. But to save you time and keep you focus on learning Firebase, you can download the starter project here, and when the storyboard is complete it should look like this and also this is what the files should look like. 1. 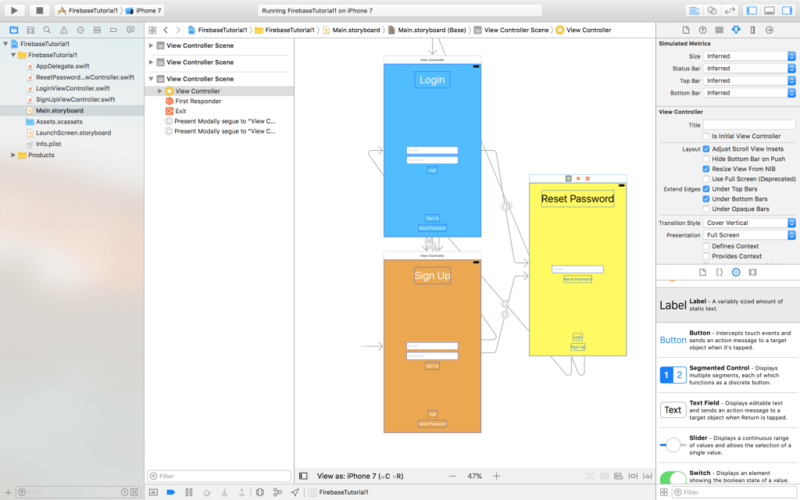 First, drag three view controllers into the Storyboard and then add two buttons to each view controller. These two button is used to navigate between different view controllers. Say, when you are on the login page, you can navigate to the reset password page or the signup page. 2. In two of the view controllers, add two text fields and a button. These text fields are used for the Email and the Password fields. The button is used for Login or Sign Up. In the placeholder, put either email or password where you want the users to enter the email and password. Then you can change the colour of the background to make it look a little bit nicer and then add a Label at the top. 3. In the third view controller (Reset Password), add three buttons, one text field and one label. The text field is for users to input the email for password reset. 4. When you finish designing the UI, the rest of the procedures is to connect the buttons with the other view controllers so that users can transit between the views. Here, I recommend that you use “present modally” for the segues. Now that the user interface is ready, we’re now going to integrate the project with Firebase. To do this you first need to go to https://firebase.google.com/ and set up the project in Firebase. 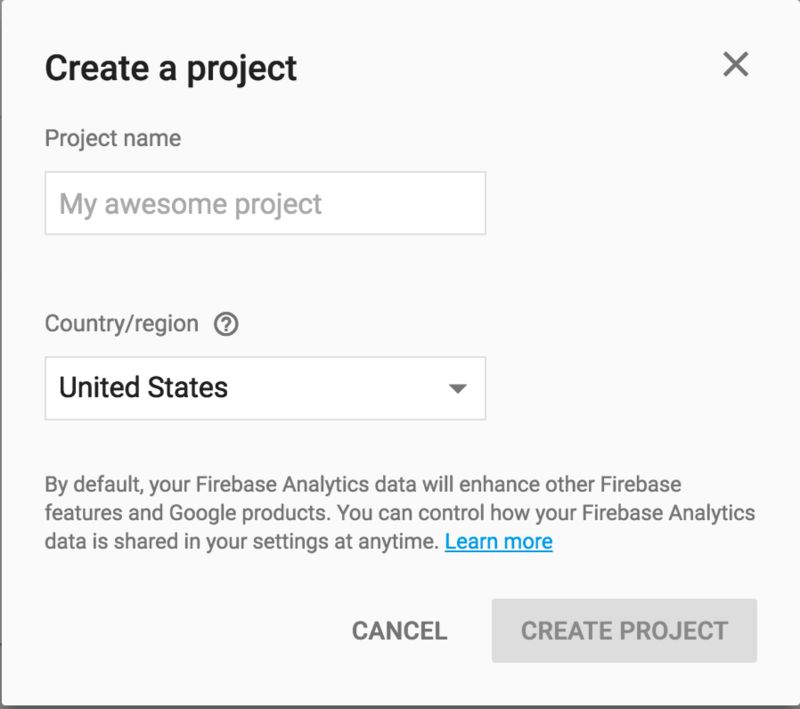 Assuming you’ve logged into Firebase with your Google account, click ‘Get started for free’ and select ‘Create new project’. It will take you to a screen where you name your project. Name your project whatever you want and then pick where you are based. Once Firebase created the new project for you, it will take you to the overview. This is where you can select your app platform, whether it is Web, Android or in this case iOS. You can also find documentation here and on the side access the authentication, storage, database and much more. 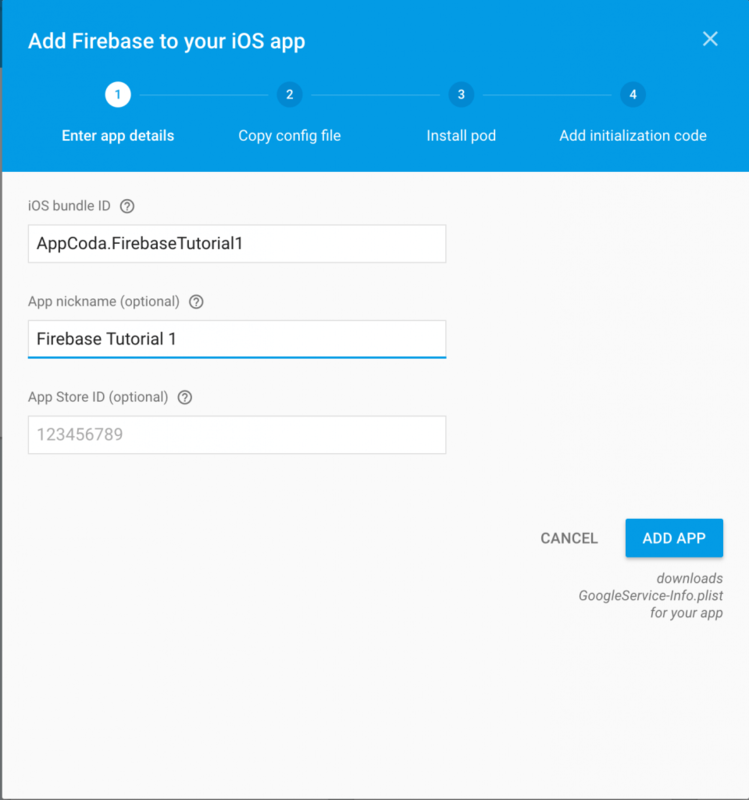 Now select ‘Add Firebase to your iOS app’, you’ll then be prompted for the iOS Bundle ID. This is the bundle identifier of your Xcode project (note that your bundle ID may be different from mine). Make sure you enter the bundle ID correctly and, optionally you can choose a nickname for your App. If your app is already live on the App Store, then add your App Store ID. But for this demo, you don’t have to do this. When you finish, click ‘Add App’ to proceed and Firebase will generate a file named GoogleService-Info.plist for you. It should be automatically downloaded to your Mac computer. This will take you to the next stage. Follow the instructions to drag GoogleService-Info.plist into the root folder of your Xcode project. Note: Please make sure the file name is GoogleService-Info.plist. In some cases, the file name may be different. Say, if you have already downloaded the .plist file before, macOS will modify the file name by appending a number to it. Next, press continue to proceed to the next step. As described by Firebase, Google services uses CocoaPods to install and manage dependencies. You’ll need to use CocoaPods to install the Firebase libraries. If you don’t have Cocoapods, please follow this tutorial to install it. This is all that you need for login and sign up. If you were going to make an app like Instagram you would use Firebase Storage and Database and others. CocoaPods will start to install the dependencies and pods into the project. When the pods are installed, you will find a new workspace file named FirebaseTutorial1.xcworkspace. 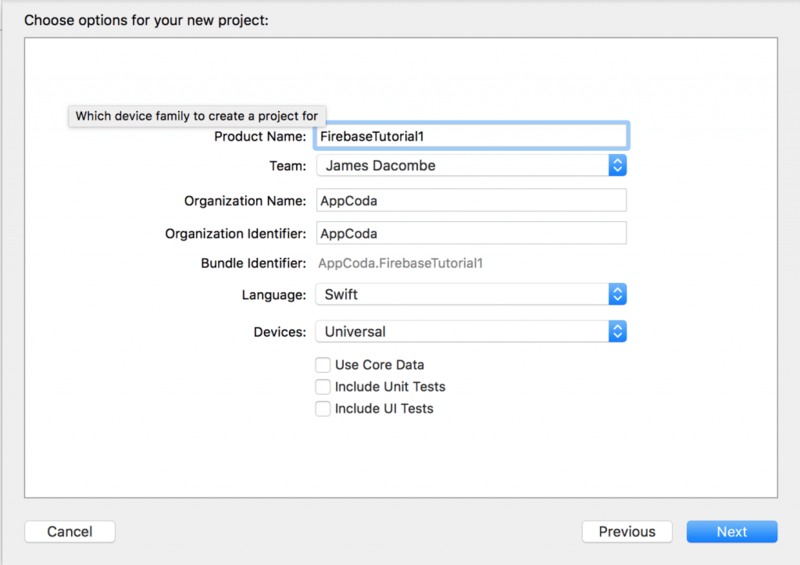 Make sure you open the workspace file instead of the FirebaseTutorial1.xcodeproj file. 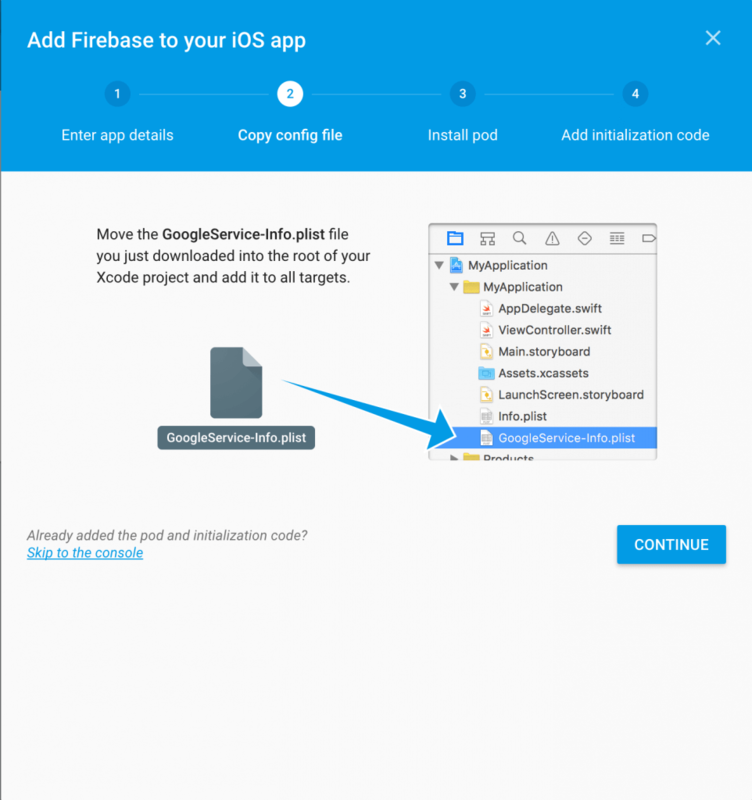 Here we call FIRApp.configure() to initialize and configure Firebase. This line of code helps you connect Firebase when your app starts up. 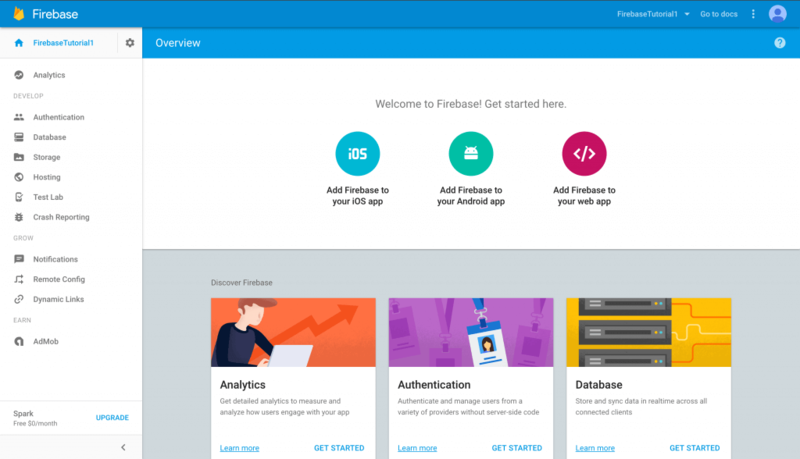 Now we’re ready to do implement the Sign Up feature using Firebase. First things first, you have to go back to the Firebase console before writing code. In the console, select Authentication and then Sign-In Method. By default, the Email/Password option is disable. Click the option and switch it to ON to enable it. Here you can also enable Facebook, Twitter and Google sign up, but this is out of the scope. Let’s go through the above code line by line. We first check if the user has filled in the email address. If he/she leaves it blank, we display an alert message. In case the user fills in the email field, we get the default auth object by calling FIRAuth.auth(), and then call the createUser method to create a user account in Firebase. When the sign up operation completes, the completion block will be called. In the block, we check if there is any sign up error. If everything is okay, we instruct the app to navigate back to the home screen. Otherwise, we display an error alert. Now you’re ready to have a quick test for the sign up function. The app should work well. After you sign up with your email address and password, you’ll be directed to the home screen and your account is added in Firebase. If you try to sign up with the same account again, Firebase returns you with an error message because the email address is duplicated. If you go back to the Firebase console, you will find the user ID in the Users tab under the Authentication section. The sign up is now working but what about the Login feature? This is what we’re going to implement in this section. The above code is very straightforward. Similar to what we have done in sign up, we verify if the user has filled in all the necessary fields. If both email and password are valid, we call the signIn method of the Firebase API with the specified email address and password. That’s it. Firebase will handle the authentication and return us the result by calling the completion handler. 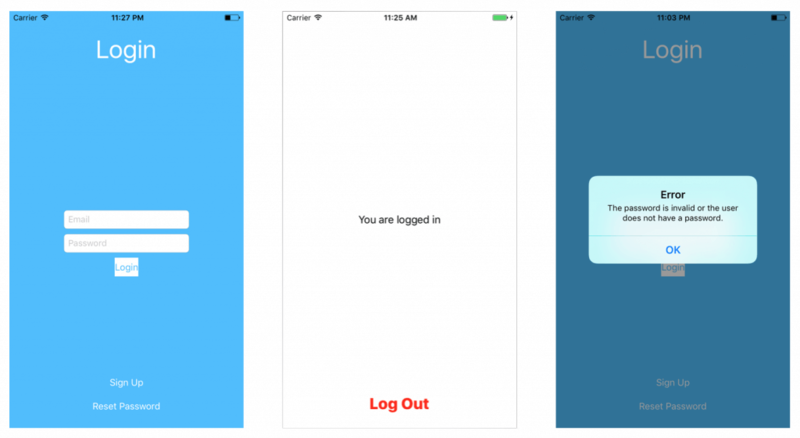 Now run the app and login with the same account as you registered earlier. Depending on your account information, it will log you into the app or display you an error. In the starter project, I have set the storyboard ID of the Sign up view controller to SignUp. After signing out, we redirect the user back to the Sign up screen by specifying its identifier. 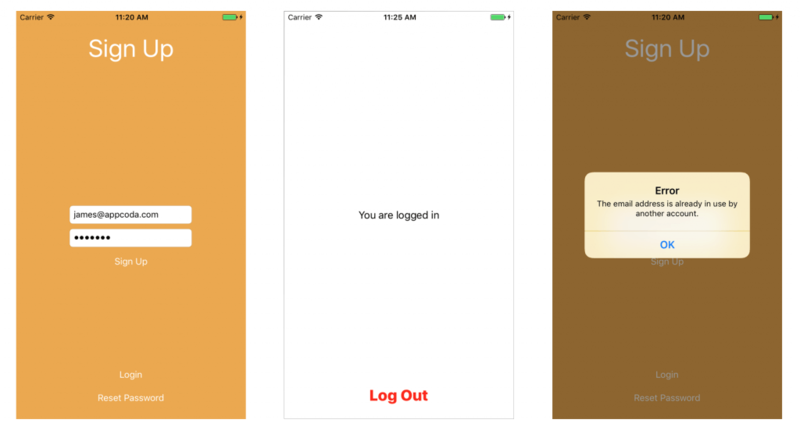 If you run the app and sign into the app, it takes you back to the sign up view controller when you tap Log out. When the call is executed correctly, Firebase will send a password reset email to the specified email address. The user can then follow the link to reset the password. In this tutorial, I have given you a quick overview of Firebase. Now I believe you understand how to implement sign up, login, password reset and logout using Firebase. Thanks for reading this tutorial. If you have any questions or comments, please leave me a message below.